If vintage or antiquarian books about Fall River, or volumes from Lizzie’s Maplecroft library are out of reach for most wallets, there’s always great views of the city on stereopticon or post cards. The golden age of the postcard must surely be 1900-1915, and there are numerous comic, seasonal, historic, and everyday street views of Fall River flooding ebay and flea markets. Civic buildings, parks, landmarks, municipal events, are recorded for posterity on these highly-collectible scraps of heavy card stock. Glitter cards and very early photographic cards are especially collectible. 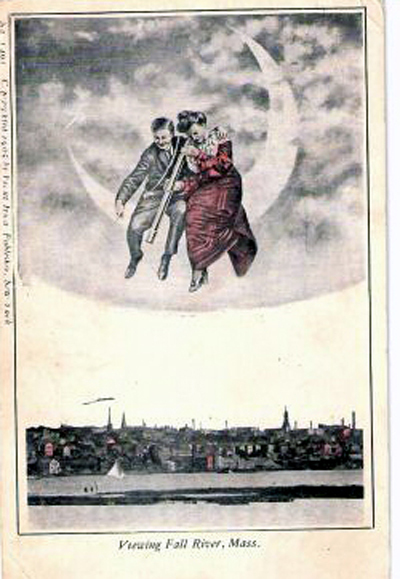 Here is a sample of a comic Fall River card which sold recently for 6.00. The happy couple is peering through a long scope lens at the city below. Can you place just where in the city they are gazing down with such rapture?